The renowned 17th-century French philosopher René Descartes coined the phrase “I think, therefore I am” to establish a foundation on which all other knowledge could be constructed. Despite not having the advantage of multimedia outlets, the impact of his thinking still resonates centuries later. In contrast, thoughts expressed through today’s “Twitterverse,” where a 140-character posting can reach thousands of eyes instantaneously, are unlikely to be as equally recognizable 500 years from now. Focused impact and relevancy have been sacrificed for abridged input and distribution efficiency. It would be naive to imply that the basic principles motivating structured data-driven clinical documentation are inherently flawed, and a return to the good old days of free-form physician narrative-driven reporting should be demanded or even seriously considered. That ship has sailed. At the same time, poor system design and/or workflow shortcuts can negatively affect content clarity for individual patient care. Society as a whole already has embraced high-volume, abbreviated electronic messaging as its preferred method of communication. Between instant messaging, text messaging, and social media such as Twitter, we’re communicating more but relating less. A generation ago, individual Christmas cards were thoughtfully handwritten to faraway friends and relatives. Today, holiday e-blasts instantly distribute generic updates to everyone on our lists. Customization has given way to automation. Sound bites have taken the place of yesterday’s thoughtful prose. And now clinical documentation is in a battle to avoid a depersonalized fate in favor of downstream data analysis requirements. Even though we’ve sacrificed personalization in favor of technology-accelerated communications for much of our personal and professional correspondence, it’s critical that patient care remain highly personal. In a world of certified EHR-generated documents, it’s important to balance accelerated workflow against personal specificity and record comprehension. Risking patient care in favor of structured data capture and meaningful use-focused output is unacceptable. The value of each report should first be measured in how well it supports patient care, not in how it fulfills the needs of downstream reporting. Both are required, but the horse must come before the cart. In any process reengineering effort, the respective needs of impacted end users typically are placed front and center. However, the mad dash for ARRA funding can lend itself to a priority shift in which the only objective is complying with meaningful use requirements to collect the financial incentives. There are arguments that substantial process efficiency improvements and total solution cost savings can be achieved through IT automation. Still, there’s debate about whether the $27 billion federal investment in the HITECH Act will deliver results beyond creating more data. Will the increased clinical data capture and reporting justify the effort and expense? Can the new aggregated data analysis deliver measurable gains in overall health? Or, as some have argued, are the projected EHR productivity benefits overstated and destined to create patient safety issues and more expenditures while delivering minimal, if any, benefits to processes and overall population health? The financial incentives driving the move to certified EHRs have made the decision to implement a question of when rather than if. Consequently, responsible managers must ascertain how this process redesign will impact report quality and documentation. Unless a platform has zero flexibility, there always will be workflow elements that can—and in some cases should—carry over. Even if the ultimate solution is rolled out in stages, a measured transition effort provides the time necessary to ensure each process stage delivers some type of independent cost, quality, and/or cycle time improvements rather than merely shuffling the woes of bad workflow design. In the end, it’s the full product lifetime cost, including increased staff time, that will determine its success. Unfortunately, the industry already is littered with failed experiments that, although certified, didn’t work in the real world. This was made clear when some attendees at the recent Medical Group Management Association conference noted they were trying to launch their third certified platform. In other words, certification does not equate to usability. Instead of focusing exclusively on price, it’s important to concentrate on how each process stage influences documentation-creation efficiency, patient care, and billing accuracy, and what checks and balances should be retained from current processes. It’s important to avoid ending up with a highly automated process that causes physicians to experience a drop in patients seen followed by an exponential jump in rejected claims. Before certified EHRs arrived, medical record technology upgrades traditionally tried to minimize daily process changes for the respective end users, especially physicians. Consequently, with the exceptions of changing from handwritten notes to dictating or adopting front-end (physician-edited) speech recognition, traditional report creation efforts (dictation) have remained essentially unchanged for decades. But now that there’s a financial incentive driven by the federal mandate for certified EHRs, many physicians and other process participants have resigned themselves to the inevitable upheaval to come. The best they can hope for is that the pain is minimized. Given the financial risk involved, however, the financial pain of noncompliance is seen as a greater evil than the inherent complete process reengineering. As providers switch from dictation to point-and-click documentation, one of the most hotly debated issues is the amount of time it takes to document an encounter. Physicians argue it is more natural and efficient for them to dictate, while technology vendors tout the projected advantages related to learning curve speed and data capture when selecting items off a menu, supplemented by self-typed notes. Table 2 below details the speeds of various communication methods. Although incremental point-and-click speed improvements have been documented in various vendor case studies looking at the time after the learning curve, there has yet to be an independent study that suggests point-and-click technology can match the speed of traditional dictation. The only exceptions are found in clinical practice settings with minimal expected diagnoses and procedural variables. It’s interesting to note that in circumstances where patient complaint, diagnosis, and treatment variables are limited, templated outputs have been suspected of being cloned reports. Given the expected advantages of active reading (point and click) as opposed to speaking (dictating), the EHR total input cycle time disadvantages can be attributed to factors such as reading through lists, mouse use, and manual data entry of supplemental content. Such physician self-documenting efforts have shown to generate an exponentially greater frequency of errors. Table 3 illustrates the findings of a 2009 report from the Association for Healthcare Documentation Integrity and the Medical Transcription Industry Association (now known as the Clinical Documentation Industry Association). Physician dictation efforts are inherently the most time efficient. When supplemented with applied technology, such as back-end speech recognition (edited by a medical language specialist) and natural language processing (NLP), the discrete data building blocks of EHR reporting can be filtered from the narrative and automatically populated into structured data for physician review, editing, and sign-off. Such blended solutions address quality concerns while satisfying both physician’s time and input preferences and meaningful use requirements. Besides the allure of ARRA funding and the inherent IT interoperability ensured by a certified platform, there are several administrative advantages gained by converting to a certified EHR. • improved intraoffice messaging and enhanced data access through superior interoperability. • Increased documentation causes a substantial reduction in provider productivity. • The provider/patient experience is negatively impacted when documenting occurs during encounters. • A large volume of templated output results in reduced specificity of patient conditions. • Personalized care diminishes when providers minimize input in an effort to reduce documentation time. • Medicaid/Medicare challenges arise when EHR documentation drives charge capture increase. • Rejected claims, such as copy forward/duplicate billed procedures, cause revenue cycle problems. • More time spent documenting cuts into the number of patients seen. The healthcare industry is facing wholesale clinical documentation process changes driven by federally mandated technology. To achieve measurable improvements, the workflow supporting the technology must deliver quality and clarity to individual patient care without sacrificing provider efficiency. However, it appears the shift to point-and-click EHR systems with supplemental self-typed input fails to deliver those results to a high percentage of providers. The House Ways and Means Committee recently jumped off the EHR mandate bandwagon when it noted that the program fails to deliver greater efficiencies and is doing little, if anything, to improve health outcomes. Accordingly, it has called on Health and Human Services to suspend ARRA payments, considering them a waste of taxpayer money. However, because downstream users in quality and revenue cycle management roles reap rewards from the highly structured, database-friendly content, the recipe for successful EHR adoption needs to focus on ensuring provider efficiency with maximum content for patient-specific care. Given such results were cornerstone benefits of the previous dictation-based efforts, blended solutions that extract discrete data from transcribed reports with NLP to autopopulate the structured data models of certified EHRs have proven to deliver the intended benefits while avoiding the quality and efficiency pains of pure EHRs. • Closely monitor patient volumes and average billed amounts to proactively address any changes. • Minimize point-and-click efforts for providers with dictation/transcription and NLP whenever possible. • Incorporate supplemental dictation vs. physician-typed input if NLP is not available or restricted. • Limit the copy forward/cloning allowed at the physician level to prevent duplicate billing issues. • Utilize trained healthcare documentation specialists whenever possible for presignature EHR data quality assurance. The transformation of healthcare documentation to a certified EHR data-driven model is inevitable. As stewards of those medical records, HIM professionals must ensure that the lasting legacy of this transition be remembered not for the damaged caused by the early, abbreviated input hurdles but rather for how those hurdles were overcome to make things work. After all, resolving complex data management issues with practical workflow solutions is their job. 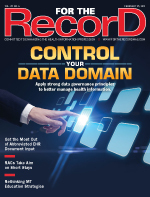 Properly generated electronic records lead to healthy patients and businesses. Whether or not these records are created with abbreviated input, quality remains nonnegotiable. Patients and physicians alike expect and deserve nothing less.